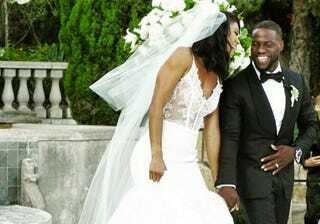 Kevin Hart married longtime girlfriend Eniko Parrish before about 200 family and friends Saturday evening near Santa Barbara, Calif.
Hart, 37, proposed to Parrish, 31, two years ago, and the two had been dating for some years before that. The bride reportedly wore a custom Vera Wang lace mermaid gown that featured hand-embroidered French Chantilly lace appliqués. Hart’s son Hendrix, 8, was his best man. Hart has also has a daughter Heaven, 11. Their mother is Hart’s ex-wife, Torrei Hart, to whom he was married for eight years.